Trying to reduce labor costs while improving customer service? Do you want to accelerate your multi-year ROI “transformation program” for consolidation, legacy modernization, BPO and/or digitization effort? Let R3P show you how to realize cost reductions within 30-day waves leveraging an automated agile approach. We can also accelerate your consolidation benefits so you won’t wait 2-3 years for ROI. Clients have discovered that a lack of documented process and timed activity data is causing major unplanned work to capture the As-Is Baseline Processes. This is causing delays in the multi-year transformational program and related 3 years ROI. Based on the decline in the 2016 economy, most clients now need savings this fiscal year, and can’t wait 2-3 years. A more agile approach with incremental benefits is being sought after. We are advising our clients to focus on their largest cost base – their people, to improve their productivity and performance. In the short term this will reduce labor costs and service the end customers quicker. Interestingly enough, the foundational prerequisite is building a baseline of current “As-Is” activity to understand how employees were spending their time. This “As-Is” documentation is often poor to non-existent. An Agile Story-Telling approach to capture use cases in a work-shop format should be considered. Often processes are not standardized among centers or within a center. Often the best-in-class worker can be used for the gold standard baseline and others can be sampled for comparison. The gaps are opportunities. Don’t boil the ocean. Inventory and prioritize Use Cases based on cost savings, sales and customer impact. Once initial 3 high priority use cases are optimized and benefits realized, move to the next wave of prioritized use cases. What clients typically discover is that an inordinate amount of time was spent (i) idle waiting, (ii) re-work, (iii) small data/technical fixes and (iv) lack of motivation. These are the improvements that can be implemented in 30 Days with great ROI. Yes, we capture opportunities for automation, digitization, integration and even robotics. However, these take longer to execute. We focus on the low hanging fruit first! A short-list of impactful improvements will be the output of the analysis exercise. Don’t get into analysis paralysis on the small stuff. Focus on the short-list of big improvements that can be implemented quickly and labor reduction realized. Plan the implementation of changes to coincide with communications, training and motivation of the workers. Get approvals to move forward and make these quick improvements. Roll-out changes largely via training and motivating. Focus is on the One-Best-Way that is already being used today by the best performer with additional improvements that can be implemented quickly. Modify the shift start, end, transition and staffing levels to achieve the required benefits while improving customer experience – wait-time and 1st call resolution. A Tool and Certified Tool Specialist Are Key to Benefits in 30 Days! The 4 Step Approach can be used by any client. However, the achievement of quick results in 30 Day Waves can only be achieved by leveraging a tool and a certified tool specialist. 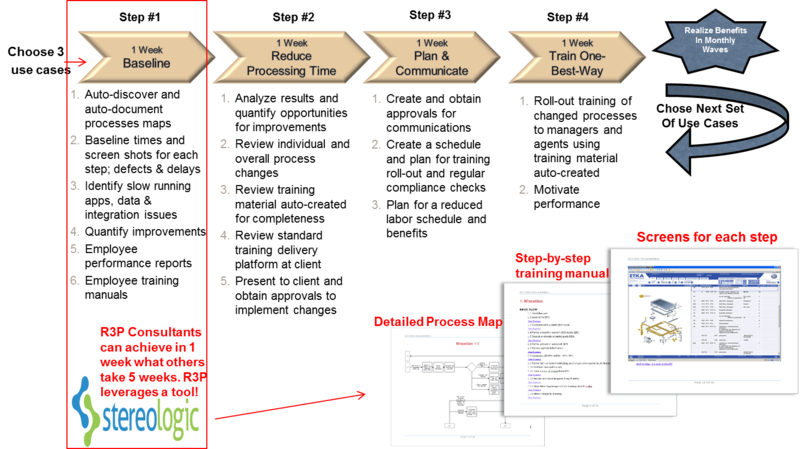 R3P leverages the StereoLOGIC tool to automate the sampling of employee performance data and timing, creation of process maps, as well as training manuals with use case format and detailed screen shots. Of course no toll is 100% automated. The Client use case SME and client process analysts are needed to interpret As-Is Process results with a context to the business function. However, they are only needed for 20% of the time normally used, and only for the high value analysis & validation, not the collection and documentation. A monthly accelerated agile approach will provide the incremental benefits clients desire and assist in transformational programs. R3P Consulting enables our enterprise clients to develop compelling strategies and execute transformational programs to achieve significant cost savings, service improvements and risk mitigation. These ambitious outcomes are achieved by leveraging R3P’s tool-sets, methodology and collective experience in outsourcing arrangements, service consolidations, process improvements and contract/vendor optimizations. Contact us to discuss how we can help you accelerate your transformation program and realize monthly savings.